There is a good reason why all our Noosa holiday homes are triple sheeted. If you’ve ever stayed in a holiday home or Airbnb and wondered if the doona cover has been washed, you’re not alone. It’s not a nice feeling and because of this all our beds in our Airbnbs are triple sheeted. This is a simple method of making a bed using three sheets and a doona. No doona cover required! This method is widely used by high end hotels. Besides that it looks great, it’s efficient and ensures a fresh and hygenic bed every time. To triple sheet, we use high quality hotel linen with a luxurious satin stripe. The linen looks great on its own but can also be dressed up to match the style of your property. A few scatter cushions and a throw make a big difference. If you’re interested in triple sheeting your holiday home, this YouTube video will show you how it’s done. Interested in our Noosa properties? 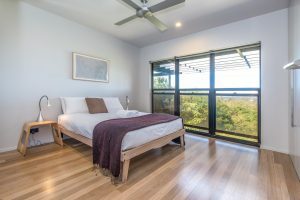 We host several holiday homes on Airbnb from Peregian to Noosa. We take care of everything including listing creation, professional photography, guest communication, calendar management, guest services, professional cleaning, linen hire and laundering. You can use your investment property whenever you like, so long as it is not booked.